If you are a partner in the MANNA network, you are a part of the nations largest hunger relief charity – Feeding America. 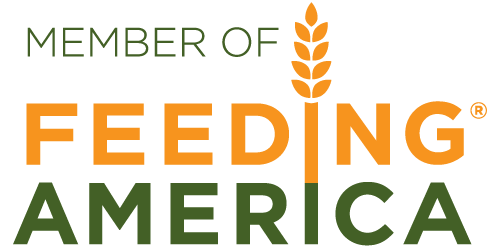 Because of partners like you, the Feeding America network is able to provide over 3 billion pounds of food across the nation. Thanks for your part! 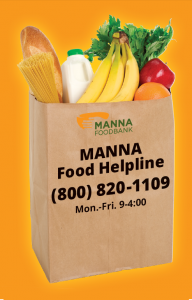 Sometimes folks get confused as to what is a food bank, what is a food pantry and what other programs are provided by MANNA. You can read about the organization by clicking here or just check out our graphic below. MANNA and most other food banks do not directly serve needy families; we rely on pantries and feeding programs to directly distribute the food. MANNA is like the “hunter and gatherer” for the network. Our partner agencies are responsible for getting the food to the families that need it. 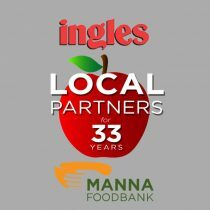 The MANNA network is fully committed to seeing that the food and financial donations given to us are responsibly and fairly distributed through our partners throughout Western North Carolina. Show your pride in being a part of the 14+ million pounds of food distributed last year in the MANNA network! Click on the links below to find your full color or black and white Partner Agency logo. The country’s most comprehensive report on the state of food insecurity in America is soon to be released. See previous year’s data by clicking here. In our efforts to utilize every resource available to help families get the food they need, MANNA has opened a food helpline. Our helpline is open M-F from 9-4 and aims to help folks in Western North Carolina determine if they are eligible for the food stamp program and to assist them with an application or re-certification if they qualify. We can also direct them to their local MANNA partner pantries and meal providers. You can access our agency network information through our Food Finder. 2-1-1 is a great resource to families in your area. It is a referral service that is free, confidential, open 24 hours a day, 7 days a week and in any language. Calling 2-1-1 can connect you with organizations in your area that can help with food, housing, counseling, health care, child care, as well as senior and disable services. Please keep your 2-1-1 listing up to date to save you and your community members time and energy when using the service. Thank you for your assistance with verifying the MANNA FoodBanklistings in the North Carolina 2-1-1 database. We want to make sure that the information provided to the community is accurate and current. Click Here for the instructions for verifying information and updating online. This also has instructions for creating a username. You will be assisted over the phone or can set up a meeting to update your listing in person. Partners are encouraged to seek additional food sources from businesses and organizations in the community. To help make these product donations possible, your organization can refer to the the Bill Emerson Good Samaritan Food Donation Act. The business in mind can donate fit and wholesome food to a qualifying non profit knowing that they are protected from liability when food is provided in good faith.